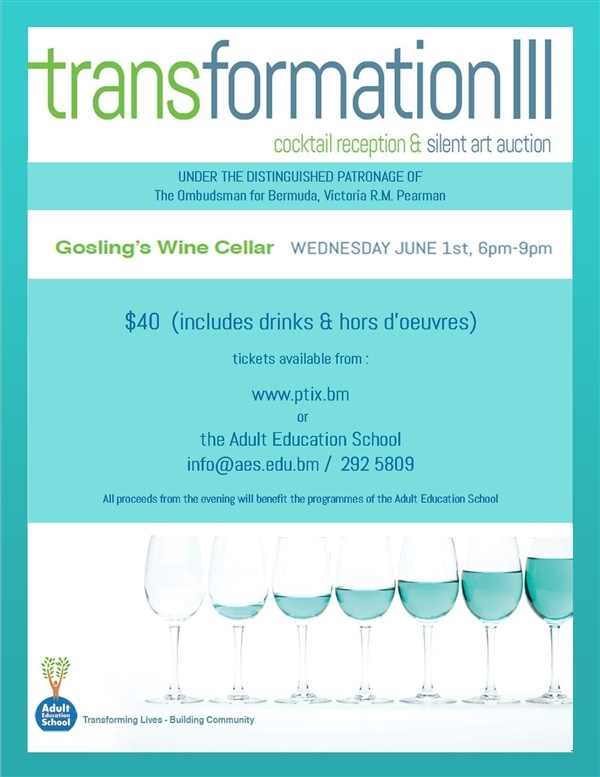 The Adult Education School will host a unique art auction and cocktail event at Goslings Wine Cellar on the evening of June 1st. The event entitled Transformations III, will feature over 25 local artists including some notable alumni from the school and hopes to raise funds to help adult learners reach their education and career goals. The evening is under the distinguished patronage of the Ombudsman for Bermuda, Victoria Pearman, an alumni of the school and is sponsored by Chubb. “The Adult Education School, located on Dundonald Street in Hamilton, offers classes in basic math, reading and writing as well as preparation for the High School Equivalency Diploma [GED]. All students over the age of 16 are welcomed and accepted. Class sizes are small and the school promotes learning in a safe and non-judgemental environment,” a spokesperson said. Notable artists exhibiting at the event include Graham Foster, Jonah Jones and Christopher Grimes but new works from Adult Education School alumni such as Katherine Summerville will also be featured. Over 30 pieces have been donated to the silent auction including paintings, photography, sculpture and mixed media. Donna Daniels, Executive Director of the Adult Education School commented, “The goal of the Adult Education School is to help Bermuda’s adult learners get the basic skills they need to be productive workers, family members, and citizens. Tickets for the event are $40 and include drinks and canapes. They are available on www.ptix.bm or by contacting the Adult Education School on 292 5809 or info@aes.edu.bm.